It’s Father’s Day on Sunday. And yet, I have but a vague notion of father. You see, after years of trying to fly high on gin, my Poppy finally grew wings when I was 5 and never came back. Even then, I could not remember what it was to have one. All I have of him are dreamy, dim bits: him going down the staircase in his checkered blue shirt and maybe one solitary father-daughter moment. In my grandfather’s room, on the high bed, the curtains dimming the bright sun from outside, my Poppy had drawn little dots and lines on his fingers and made finger puppets. Now, I’m older than my father ever was, and it’s an odd feeling. My only photo with Poppy. It’s Father’s Day on Sunday. Who among my fathers should I greet? I’ll send it out to two. They were the closest to having fathers I ever had. I was meant to love them, find myself finally as someone’s daughter, see them as my own. But I never really felt myself a daughter. They were my mother’s husbands, my brothers’ dad, my siblings’ papa. And I was always someone else’s daughter. They did try. They would grant me the same privileges, shower the same gifts, sometimes more, compensating for the lack of “father-ness” they themselves felt. I was even to call him “Daddy.” It should have been easy, being only 5. I had a whole lifetime to practice and make perfect the joys of being a daughter. But you see, you could never really teach a child to alter her truth. Child’s play did not include imagining fathers. I knew they were not mine. Much as I had dreamed and wished it to be. I had even written my 2nd dad’s family name right next to mine, hoping that maybe that would do the trick. But it still wasn’t real. And I always felt myself a stranger, set apart, a member never really belonging. In a portrait of family, they were inside the picture, I was halfway in, halfway out. I was the baggage they had to carry with them, so they get the girl. And wherever my mom went, I had to be lugged alongside her. Try as I might, I could never dig deep enough to reshape my heart’s lack of real fondness for fathers. I did strive. 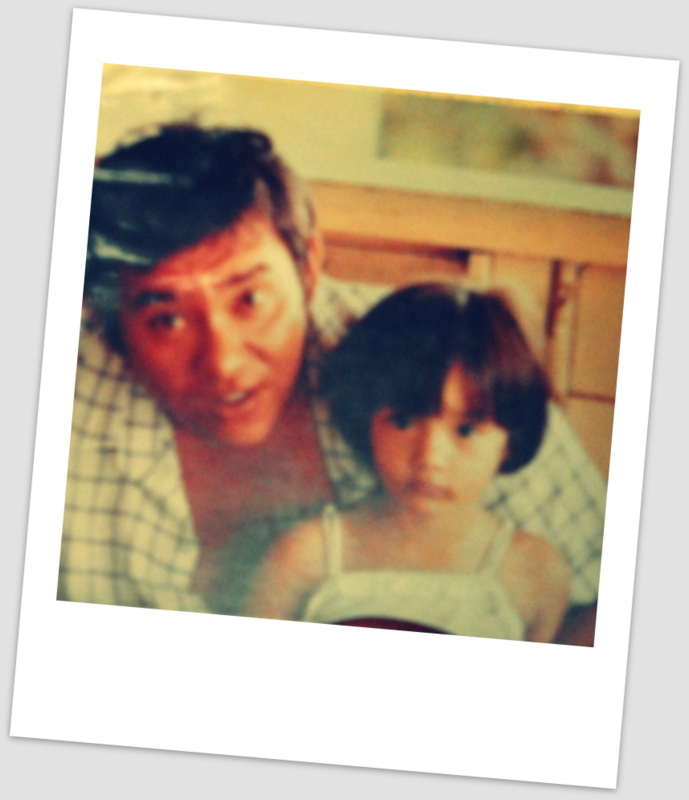 Went along with them, beamed my half-smiles, hugged them sometimes, gave them kisses in church and on their birthdays. I even cried alongside them when my mother left them. And still I know I do not have enough to make it for a Father’s Day on Sunday. I envy my children. They have so much love for their father. And him for them. They have wet kisses, Tickle Monsters, Pedro stories, piggy-back rides, belly laughs and photographs. I never had those. All I have are memories of one lone afternoon of finger puppets and a lifelong desire to feel love for fathers who were there, but were never really mine. So, in my version and heart rending notion of a father, a Happy Father’s Day to my three Dads!